This adapter is for QR15 forks. It is compatible with the Thule 561 Roof bike carrier and anodised in black. 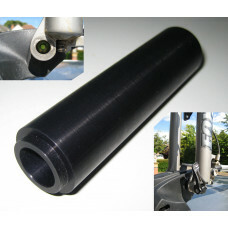 Similar to the Thule 561-1 accessory. The adapter measures 100 mm wide with a 15 mm hole in the middle for the QR15 axle. It has a step on each end, just like a QR15 front wheel hub so the bike will stand on the adapter even before the axle is inserted (although we don't recommend you do this! ).